Sixteen athletes from Bossier Parish schools have qualified to compete in the Class 5A and 4A boys and girls divisions in the LHSAA Outdoor Track and Field Championships Saturday at LSU. 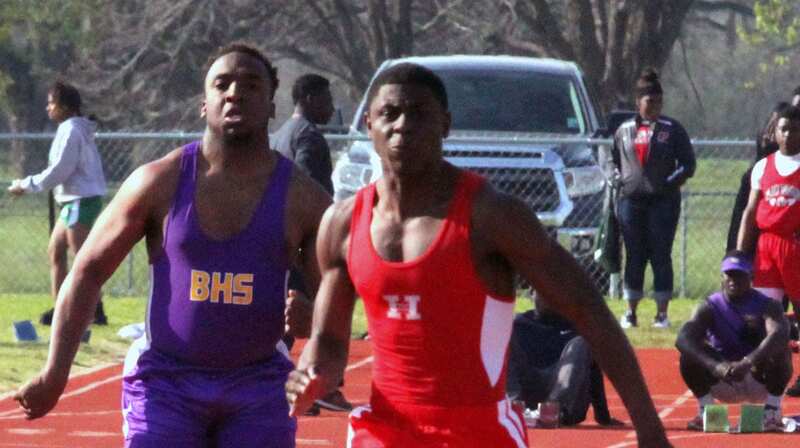 Haughton senior Antonio Woodfork qualified in four boys events last week at the Region I-5A meet in Natchitoches. Woodfork swept the 110- and 300-meter hurdles. He and Kristian Fulton of Rummel have the fastest qualifying times in the 110 at 14.15. Woodfork’s time of 38.62 in the regional is the fastest qualifying time in the 300. He was the state runner-up in the event last year. Woodfork also finished second in the long jump with a leap of 22 feet, 6.5 inches and third in the high jump with a 6-2. He has the fifth-best qualifying long jump. His high jump height is only two inches less than the top qualifiers. Airline’s Xavier Johnson also qualified in the 110 and 300. He finished second in the regional in 14.33 and third in the 300 in 38.95. Parkway senior Sara Funderburk qualified in two events in the Region I-5A girls meet. She won the 1,600 in 5:16.62 and finished second in the 3,200 in 12:10.66. She has the second-best qualifying time in the 1,600 behind Mandeville’s Claire Crosby (5:05.65). In the 3,200 Funderburk was conserving her energy for the 4X400 relay. The 4X400 was the final event and came directly after the 3,200. Her time is the sixth fastest among qualifiers. Last year, Funderburk won the event in 11:45.02. Parkway barely failed to qualify in the 4X400, finishing fourth in a school-record 4:09.63. Haughton sprinter Josh Lister is the top qualifier in the 5A boys 100. He won the regional in 10.51. The second-best times were by Acadiana’s Jayrin Wilson and Scotlandville’s Trenton Charles, who ran 10.70 in their regionals. Lister, Lavonta Gipson, Kynan Hayes and D’Kovin Ware have the top qualifying time in the 4X100 at 42.35, just .02 faster than No. 2 John Curtis. Haughton junior Savannah O’Neal is the No. 3 seed in the girls 5A javelin. She finished second in the regional meet with a toss of 116-11. Airline’s Seth Papineau qualified in two events in 5A boys — the 1,600 and 3,200. He won the 3,200 in the regional meet with a 10:42.22 and finished second in the 1,600 in 4:30.56. His 1,600 time is the fifth best among qualifiers. Parkway’s Cole Billiot finished second in the 3,200 in 10:16.23 to qualify. Haughton’s Inez Green qualified in the 5A girls shot put with a toss of 36-3, good for second in the regional and the fifth-best qualifying distance. Benton qualified five athletes in the 4A meet. Four girls qualified — Taylor Davis, Mallorie Gill, KeKe West and Breanna Bundy. Ryan Campbell was the lone boy. Davis finished second in the high jump in the Region I-4A meet at Benton last week with a leap of 5-2. Her height is tied for the second-best among qualifiers, just two inches below the top height. Gill was second in the regional in the javelin with a toss of 104-0.5. West took second in the triple jump with a 35-10, the fourth best among 4A qualifiers. Bundy was third in the pole vault, clearing 8-3. Campbell finished third in the 800-meter run in 2 minutes, 4.48 seconds.